Implementing bike sharing isn’t easy – a number of factors need to be aligned for a system to succeed and thrive. Bhopal and Bogotá are two cities that have tried unsuccessfully at adding city-wide bike shares in the past. Now both are trying again. Bhopal’s latest effort, Chartered Bike, launched in June 2017, and it already seems to be more of a success with more than 25,000 registered users joining in the first five months. Bogotá’s is planned to launch later this year. 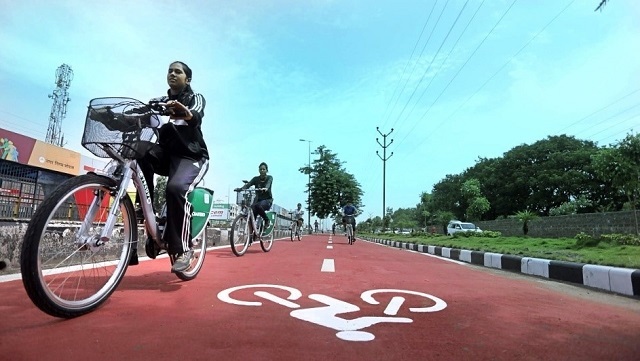 Early pilot systems in Bhopal, designed as bike rental programs rather than traditional bike-sharing systems, struggled to get off the ground, and the public sector had difficulties attracting private-sector investment. When pitching the latest system, the city once again found few partners interested, according to Chandramauli Shukla, CEO of Bhopal Smart City Development Corp Limited. The city learned that it needed to convene technology suppliers, operators, financial institutions and public agencies to develop a public-private partnership. This allowed the cost burden to be shared between the public and private agencies and directed all the revenue generated by the system back to the private agency, thereby ensuring long-term feasibility of the service. In Bogotá, city officials learned the importance of evaluating and structuring proposals by bringing together public and private stakeholders to create a system that will be tailored to the needs of residents. “Through workshops and technical support, the FSCI helped us understand the different types of schemes, business models, their advantages and disadvantages, and try to develop the best option for Bogotá,” says the city’s Sub-Secretary of Mobility Sergio Martinez. Financial sustainability is an important challenge that cities face in any project, and blending funding from different sources is key to long-term financial viability. In Bhopal, revenue from user charges and the city’s budget are complemented with additional sources, such as sponsorships, advertisement rights and parking fees. This was one of the key lessons that emerged from workshops and trainings between the FSCI and city officials. “The FSCI and WRI helped us design an innovative model,” says Shukla, adding that the main challenge was attracting the private sector to engage and invest in the city. At first, there was little public support for bike sharing in Bhopal, largely due to low levels of cycling in the city. Earlier pilots were rarely integrated with the wider transport network. With Chartered Bike, Bhopal focused explicitly on safety, design and integration to encourage ridership. The expansion of cycling, coupled with a new 12-kilometer-long and 5-meter-wide cycle track, put more people on bikes. “[Bike sharing] has become a source of pride for the citizens,” says Shukla, adding that the system has been embraced by residents of all ages. Integrating bike sharing with the wider transit network is crucial for a successful system, as it helps the system slot into to daily routines. Bogotá’s Bicycle Manager David Uniman stresses that the city’s new system will allow commuters to plan trips by foot, cycling and TransMilenio, the city’s extensive bus rapid transit system. 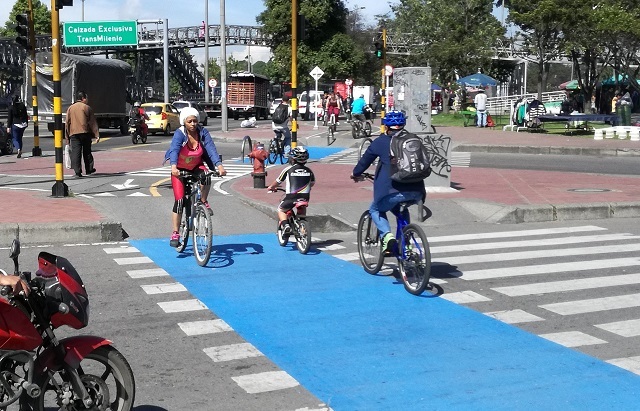 In Bogotá, a city where the population has doubled in the last 30 years reaching 8 million residents, officials are taking steps to build on an already strong bicycle culture, including an extensive network of more than 450 kilometers of bike lanes. The new bike-sharing system will serve as a complementary mode of transport to mitigate concerns of congestion and air pollution, which still plague the city. As a result, many commuters are excited about the prospect of bike sharing in their city. “People often don’t own a bike,” says Laura, a regular cyclist, “so the fact that the city is giving people a chance to easily access shared bicycles could encourage bike use.” Even for casual cyclists, bike sharing provides an efficient and convenient alternative to driving and can complete the crucial first and last mile of a commute. Martinez explains that the Bogotá city government sees bike sharing not only as a key to improving mobility, but also to improving quality of life. He argues that if people would only give it a shot, they would realize that it’s the best mobility option in the city. “The truth is, all you have to see are the cyclists’ faces – in general, they look happier than drivers,” he says. Although Bhopal’s system is still very young, the city’s experience may prove helpful for others around the world. Despite initial skepticism, Chartered Bike is now popular among the city’s public and political spheres, and the model is spreading nationwide – around 30 similar programs have already popped up across India.